The Suomi NPP satellite captured this infrared nighttime image of Hurricane Irma between Cuba and the Florida Keys on Sunday (Sept. 10) at 3:38 a.m. EDT (0738 GMT). Update Sept. 11: Irma was downgraded to a tropical storm as it moves northward after battering the Florida peninsula. National Oceanic and Atmospheric Administration (NOAA) satellites have been capturing imagery of Irma, Jose and Katia since they first began to form in the Atlantic Ocean and Gulf of Mexico. Cameras on the International Space Station have also shown Hurricane Irma through the eyes of astronauts. Scroll down to seee the latest videos of Hurricane Irma, as well as Jose and Katia. See complete Hurricane Irma coverage from our sister site Live Science. NOAA GOES-13 views of Irma and Jose from Sept. 10-11, 2017. NOAA GOES-13 satellite's view of hurricanes Irma and Jose from 6am EDT to 8:15pm EDT on Sept. 10. NOAA GOES-13 satellite's view of hurricanes Irma and Jose from 8:15pm EDT on Sept. 9 to 6:45am EDT on Sept. 10. NOAA GOES-13 satellite's view of hurricanes Irma and Jose from 8:45pm EDT on Sept. 8 to 8:45pm EDT on Sept. 9. NOAA GOES-13 view of the storms from Sept. 7-9, 2017. Irma hit Cuba as a Category 5 hurricane, but has since weakened to a still powerful and dangerous Category 4 storm. 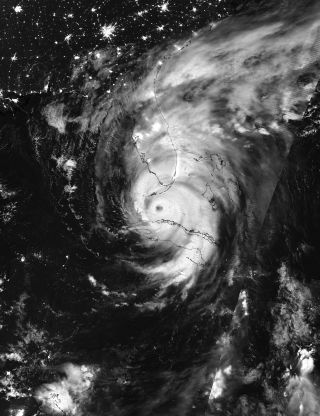 It is expected to strengthen again as it approaches the U.S. mainland in Florida. Hurricane Jose is a Category 4 hurricane and Katia was downgraded to a tropical storm. The Space Station's external cameras captured imagery of the two storms. NOAA's GOES-16 satellite's Geostationary Lightning Mapper (GLM) has captured imagery of lightning flashes in the churning clouds of Hurricane Irma over the course of 80 hours (Sept 4-8, 2017). "Hurricanes don't often exhibit a great deal of lightning, because their winds are mostly horizontal, not vertical," according to NOAA. As of Sept. 8, Irma is category 4 hurricane, Jose is category 3 hurricane, and Katia is a category 1 hurricane. Irma was a category 5 hurricane when this video was shot. Watch as Jose develops into a hurricane behind Irma. Antigua and Barbuda, St. Kitts and Nevis, the British Virgin Islands, the US Virgin Islands and more Caribbean nations come under Hurricane Irma’s wrath. Follow Steve Spaleta @stevespaleta. Follow us @Spacedotcom, Facebook and Google+.